One of the hottest costumes of 2017 is going to be the Pennywise costume. Whether you choose to be the actual Stephen King character or some other form of a scary clown, this guide will help you make the most out of your Halloween costume. Some links in this post may or may not be affiliate links. If you click on a link, I may earn a small commission, which helps to support me and my blog. Thank you. Pennywise. Stephen King’s iconic killer clown has been the stuff of nightmares for years. I remember loving the book when I first read it all those years ago. And then of course was the TV miniseries with Tim Curry playing Pennywise that scared the crap out of people all over. Now, my favorite story from the original was in about 8th or 9th grade, I went to a lock-in at my friends’ church. Somehow, we were allowed to watch IT. I love horror movies, and while it gave me some chills, I wasn’t absolutely terrified, unlike my friends. The next morning, my friend’s mom is dropping me off at home. There, stuck in a tree in the front yard, was a lone red balloon. I didn’t live in an area where someone could have easily left it there as a joke. It was completely random. My friend bursts into tears and begs me to not get out of the car. I was also crying, but more from tears of laughter. I think I had to call her every few hours to reassure her that I was okay. And obviously, 27 years later, I’m still here. And so is Pennywise. The reboot just came out in Fall 2017 and fans are heading out in droves to check it out. This movie focuses more on the childhood part of the story, with a sequel in the works to address the adult resurgence of the killer clown. Add to this the scary clown sightings earlier in 2016, and Pennywise makes for the perfect scary Halloween costume. Here are some ideas to help you get started. You can find these items on Amazon. So what makes for a good Pennywise costume? The 2017 Pennywise is based on a more old-fashioned look from about the 1800s or early 1900s. You want to start with a basic jumpsuit in yellow, or maybe a white or off-white. It needs at least three large pompoms in a line down the front of the jumpsuit. Some costumes also have a colorful vest and even a large ruffled collar. Round it off with white gloves and big boots. Pennywise Shoes Cosplay It Costume Halloween Boots Red & White Props Accessories US Male 9His face is white with a large red-ripped nose, pencil-thin eyebrows and dark-lined eyes. Most importantly are the razor-sharp teeth hidden behind bright red lips. And of course you need the trademark wild red hair. Rubies Costume Mens It Adult Pennywise Wig, Multi, One SizeIf you have the parts of the costume and some skills, you can finish it off by using a makeup set. Rubies Pennywise IT Movie Make-Up KitIf you need a little bit more help, use a full blown mask. Or you could save yourself a lot of time and just get an entire costume. Luckily Amazon has plenty from which you can choose, as do other retailers. 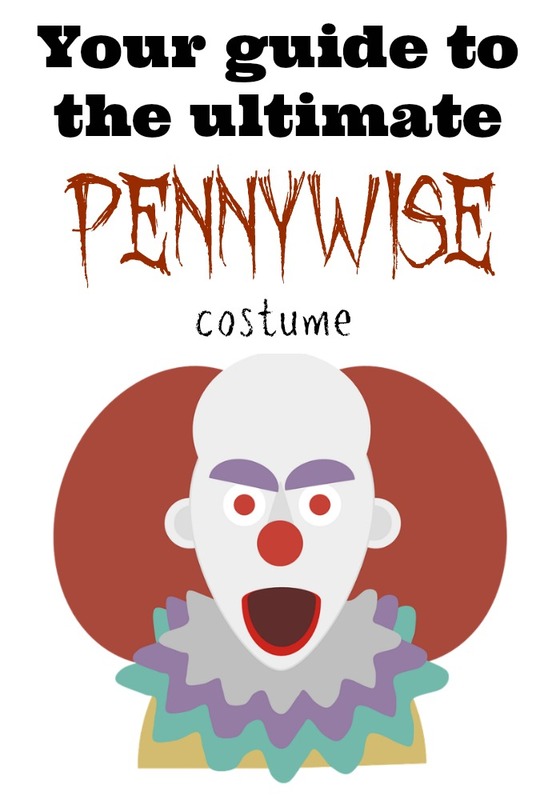 So dress up and have fun in your Pennywise costume this Halloween!